We meet on Tuesdays and Thursdays from 6.30pm at our clubhouse, the Myra Garrett Pavilion. This is located in the grounds of Erith Leisure Centre, on the opposite side of the running track to the main building. Training sessions start at 7pm and usually last for about an hour. Road Runners are split into several groups depending on fitness and ability. Each group has at least one qualified coach to introduce a training session, ensure suitability and accompany the group. Your coach will also be happy to arrange a suitable time to discuss training, diet, injury and other concerns with you. The planned training sessions are published on a monthly basis on the clubhouse notice board, and via email or social media. The sessions start at 7pm and they vary in nature depending on the plan created by your coach. We use local road and parks, and the runs usually consist of steady runs (4 to 7 miles) as well as technical sessions (fartlek, hills, reverse split, intervals etc). We also make use of the track for some of the sessions. Members can join our Road Running Facebook group for updates, photos, information and discussions. We hold details of a whole host of various road and trail runs of varying distances which usually take place on a Sunday. These include 5, 10 15 and 20 mile runs, marathon and half marathon distances, 5 and 10k races and cross country. 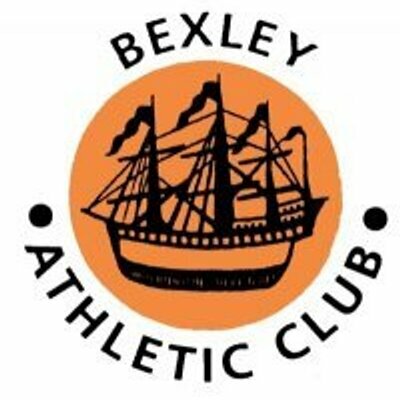 Bexley AC is affiliated with England Athletics, which provides members with discounted entry to many organised races when you provide your England Athletics registration number. We also offer club sponsored races where teams are entered i.e. Beckenham Relay, Swanley Relay and sometimes we have friendly events with other running clubs. All these can be especially rewarding. We have some competitions that run through the season. The Road Running Grand Prix is over a selection of distances at different locations ranging from 5 to 26 miles and you score points based on your finishing position and prizes are allocated per group. There is also the annual Club Championships held at our track in Erith which involves all athletic races and disciplines. This is held every last Tuesday of the month on a training night and is an accurately measured and timed distance and is an excellent indication of your progress. We occasionally arrange to participate in a race or event in other countries or further afield in the UK. These can be marathons or mudfests and we have an exchange arrangement with a club in Germany. Our presentation night is usually in October. As well as awarding medals, cups, shields and certificates, this formal but fun event is a great opportunity to socialise with other club members across all groups while celebrating all of our achievements. Also keep an eye out for our annual Summer Barbeque and other social events.